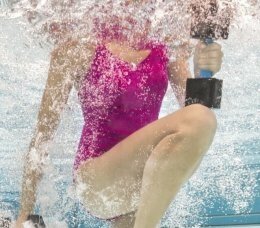 Do you want to look and feel your best during water conditioning programs? Luckily, designers are customizing unique styles with little extras that address common physical concerns for all ages. Functional yet fashionable details help you embrace and enhance your body. Browse swimandsweat women’s and plus-size slimming swimsuits for clever elements that will slenderize your figure. Our durable chlorine-resistant fabrics are ideal for frequent fitness sessions. Look for low-cut necklines that feminine décolletage, which will draw the eye upward. Besides showing off your assets, daring V-necks create vertical lines that increase your height and minimize your width. Bra cups and underwire provide hidden foundation that will support, lift and enhance the bust. Wider shoulder straps are the most comfortable, especially for water activity. Bodice details like center seams and zippers construct long upright lines that divide your torso down your middle. Those extended elements establish focal points that give you a taller, leaner frame. Strong horizontal necklines with wide straps make your strong shoulders the star. They emphasize your top half for a beautifully balanced silhouette. For extra upper coverage and support, explore bathing suits with high-cut necklines and/or backs. These raised areas minimize, contain, and support your figure. Your resulting sleek and smooth form will promote swimming ease and confidence. Break away from your one-piece habit and try modern two-piece bathing suits with sporty tankini tops. Loose-fitting cuts allow free arm, torso, and leg movements during pool activities that require extended stretching. Styles that skim over your shape instead of clinging to it will help you look leaner, while still providing full midsection coverage. Search for swimandsweat slimming bathing suits with delicate shirring or ruching for elegant contouring and control. Beautifully gathered fabric camouflages imperfections with softly draped folds that slim, firm, and smooth your appearance. These design tricks produce long upright delineations between condensed bathing suit portions. Contrasting side panels or splices border a thin central section. Its narrow width slenderizes your torso. Princess seams feature tapered vertical lines that divide your swimsuit’s front into a trio of contoured segments. The welcome curvy illusion gives you an enviable hourglass figure. Hidden inner power mesh liners and tummy control panels trim, tone, and streamline your figure. Firm yet gentle compression works wonders, smoothing your profile like shapewear you conceal under daytime and evening fashions to look leaner. Sheaths, swim dresses, and sarong fronts hang down longer than other styles, giving you a little extra modest length. Those elongation methods help blur the boundaries between your upper and lower halves, making your silhouette more graceful and trim. For greater thigh coverage, go for one-piece unitards or pair tankini tops with shorts or skorts. Various hues, intensities, and their body placements have magical transforming effects. Search for color blocking options that cover areas you want to shrink in darker tones. Fashionable alternatives to popular and dramatic black include nautical navy, water-inspired Mykonos blue, royal blue, tempting teal, regal purple, and feminine berry. Pick lighter, brighter shades for regions you choose to accentuate. That combination creates a flattering look that evens out your proportions. Selecting prints that claim more focus than your figure concerns will boost your confidence. Small, prominent swirly and bidirectional configurations trick eyes to follow their random shapes instead of your contours. And the amazing result? You appear slimmer. Pattern placement is another clever design trick that gives your form an instant makeover. Slimming swimming suits with conspicuous upper designs and plain bottom portions in darker solid colors pull interest higher, minimizing lower areas. Stretchy swimandsweat slimming swimsuits and tummy toners hug your curves snugly. To avoid squeezing into tight ones that will highlight figure flaws, consider going up a size. Less confining fits will feel more comfortable and smooth out your shape for a sleeker, leaner look.